As the rains rejuvenate the Western Ghats landscape, the forests brim with the noise of life. For bird watchers, wildlife enthusiasts and those who are looking for a pause from city life, some of central India’s National Parks provide a great escapade. There is no need for elaborate planning. One can quickly hire a car and hit the trails that lead to the wilderness. Here are some of the best wild destinations that are absolutely worth a road trip from Mumbai. 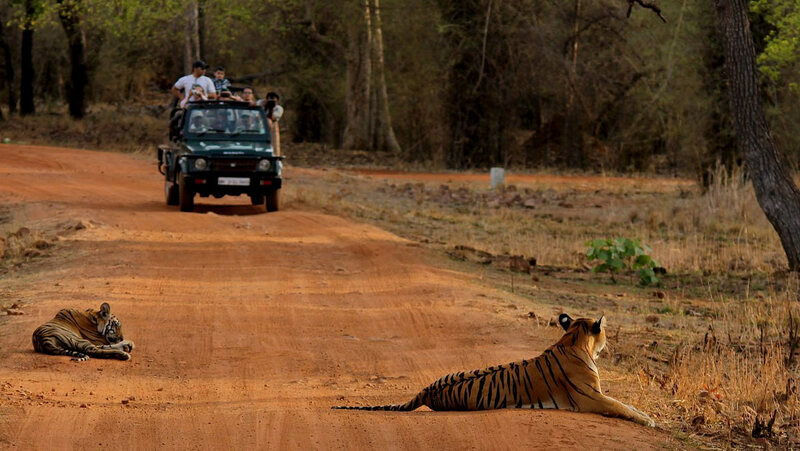 Considered one of the best places to sight a tiger, Tadoba National Park is around 850 kms from Mumbai, an epic road trip that includes a mid-way stop at the historic city of Aurangabad. Maharashtra’s oldest National Park has many wetlands, including the Tadoba Lake, home to a large population of marsh crocodiles. Of course, the emperor of these jungles remains the tiger. Other rare species that live in Tadoba include serpent eagles, honey badgers and many smaller wild cats. A forest that inspired the Jungle Book, it is easy to see why Pench is one of the most important tiger habitats in central India. It requires a trip into the neighbouring Madhya Pradesh, an epic 900-km trip across the heart of the country. The rugged terrain here is perfect country for the world’s biggest cat. The last census reported the tiger population at around 40. Other flagship species found here include Indian leopards, striped hyenas, gaurs and various deer species. Close to the hill station of Matheran, Karnala Bird Sanctuary is a haven for ornithologists. Armed with a pair of binoculars and with an early morning start, one can enjoy glimpses of some of the rarest birds in India. Birds found here include woodpigeons, parakeets, sunbirds and hornbills. In total, more than 220 bird species have been recorded in Karnala Sanctuary. The fort located here is a popular hiking destination. Karnala is one of the closest sanctuaries to Mumbai. An ancient fort in the middle of the forest conjures legends of explorers and hidden worlds. Such is the allure of Koyna, located close to Satara town and 280 kms from Mumbai city. Apart from the mystical ruins of the Vasota Fort, the Shivsagar Lake provides a mesmerizing setting. The thick forests are tucked in the green, lush mountains and when the sun sets, predators like tigers and leopards go about their business. Other species found here include a wide variety of snakes like the Indian Python and very elusive King Cobra, while the Indian giant squirrel is one of the more endearing tree-top residents. It is best to take these trips in total freedom. For car hire in Mumbai, many informed travellers are choosing Zoomcar, an app-based rental platform. Apart from affordable plans and a choice of the latest car models, be they hatchbacks, sedans or SUVs, travellers also enjoy 24/7 on-road support – ideal for long trips into the countryside. By renting a car for the road trip, travellers will enjoy complete privacy and they can make detours and stops as they wish, adding more experiences to the journey.